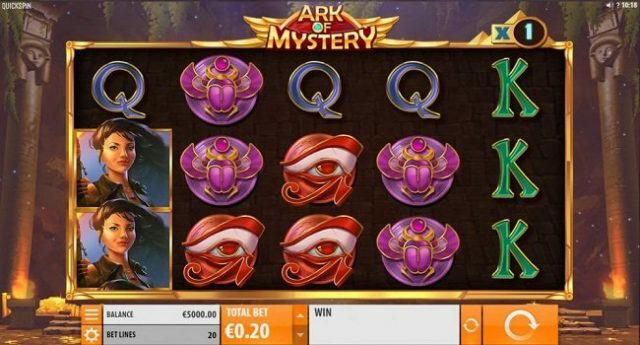 Ark of Mystery is a 5 reels and 20 paylines slot game developed by Quickspin gaming. Coin sizes for the game ranges from 20p to £100 per spin. You can get 1,000 times of your total bet, while playing this video slot at your devices like mobile phones, smart phones, tablets or desktops. There are 2 bonus rounds available in this game. Ark of Mystery is a slot game inspired by Egypt and its ancient’s kingdom lost treasure. You will have to unlock the missing treasure after fighting a battle against curses of the ancient Pharaohs. The game comes in with Wild Ark Respin feature where you would be awarded 6 free spins (respins). The game also has a Multiplier Booster feature which would multiply all you’re winning up by x22 times if you are lucky. Ark of Mystery slot is a superb looking slot graphically because it is based on the ancient Egypt and feels like you are watching story of Indiana Jones. The symbols of this game are A, Q, J and 10 pyaing cards along with scarab beetles, ankhs and the eye of the Horus. Anna is the Heroin of this slot game which is the highest paying character/symbol as well. It will pay you 50 times on your total stake if you land 5 of these symbols across a payline. The game has a wild symbol in the form of the ark and it will substitute all other symbols on your screen except the Multiplier Booster symbol, but the wild only appears on middle 3 reels i.e. on reel 2, 3 and 4. As mentioned earlier, Ark of Mystery slot has 2 bonus features. The first one is Wild ark respin feature which gets activated when you land Wild Ark symbol on any of middle 3 reels. Play this slot for free or for real money at quickspin casino online.